Well-placed EA sources report that former President Hashemi Rafsanjani has asked the Supreme Leader to free opposition leaders Mir Hossein Mousavi and Mehdi Karroubi, held for 40 months under strict house arrest. 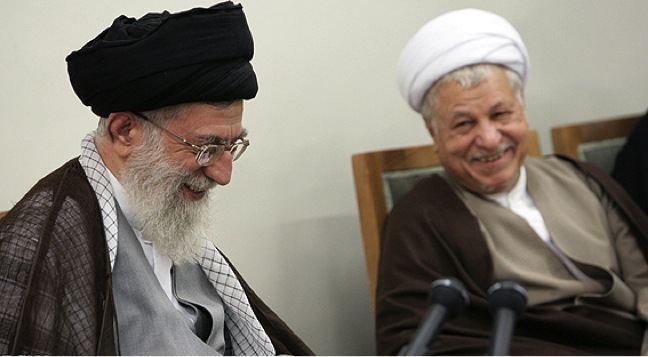 The sources say Rafsanjani approached Ayatollah Khamenei to suggest that Mousavi and Karroubi — both of whom stood in the disputed 2009 Presidential election, in which Mousavi may have had more votes than the “winner” Mahmoud Ahmadinejad — be freed during the memorial ceremonies for the death of Ayatollah Khomeini. Rafsanjani’s approach has been supported by public statements of senior clerics, including the Supreme Leader’s brother Seyed Hadi Khamenei. The Supreme Leader, who has rejected previous attempts by Rafsanjani to free or ease the abuse of political prisoners, rebuffed the approach. However, a well-placed source says Rafsanjani will follow up the issue if Iran’s talks with the 5+1 Powers for a comprehensive agreement are successful.